I have always enjoyed pursing various activities and visiting various places by myself, experiences I have written about in the past for The Sarasota News Leader. However, as I have been reflecting lately on the comfort I find in crowds, I would like to explain that my choices for outings involve more of a hands-on approach than I earlier may have indicated. I am not just a passive observer/people watcher. For example: I am a long-time member of the Y. Some days I can hardly wait to get there and blend in among the huge and impersonal machines and all those people whose faces look familiar but whose names I do not know and do not want to know. When I walk into the Y and wave at the staff, I immediately feel a sense of peace and calm. The noise of members almost literally racing by me, the background music and the sounds emanating from the main gym — including the clang of equipment and “booms” of weights being dropped — relax me and make me feel secure. People of all ages and sizes — with, I might add, various tattoos all over various parts of some bodies — wander around, smiling occasionally. The peaceful vibe they all generate reassures me, fostering my comfort and security in this crowd of strangers. For another example: When I go to the Farmers Market in downtown Sarasota on Saturdays, the minute I cross First Street and walk toward Lemon Avenue, my whole body begins to smile, if you will. I know I am within 20 feet of the excitement. I can smell the fried eggs and sausages sizzling on the grill, and I can hear the music — such as samba, jazz and pop selections. Of course, my favorite part of all is knowing I am one minute from petting and smiling at some of the seemingly unending assortment of beautiful doggies out there, many of whom are showing off. There is nothing more relaxing and comforting to me than being alone in this wondrous and happy crowd. And I have to say nowhere else have I ever seen so many smiling faces — on the humans and the doggies. Crowd comfort is no doubt a matter of degrees. I know, for myself, that huge crowds, akin to stampedes, give me instant panic attacks. 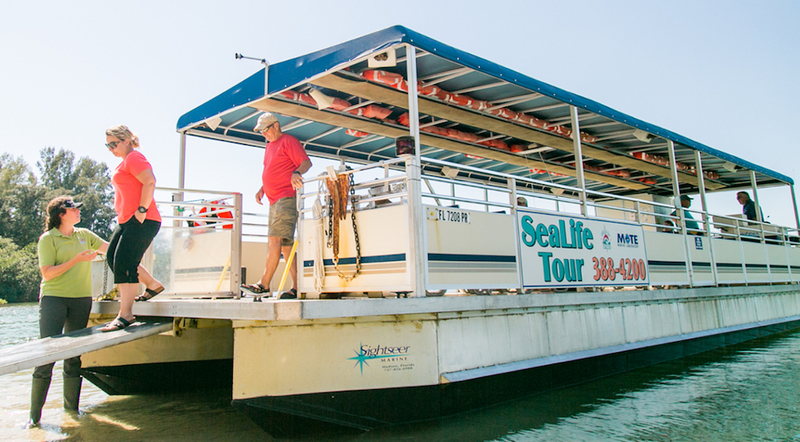 Another local activity I thoroughly enjoy is the Sarasota Bay Explorers tour offered at Mote Marine. Working in conjunction with Mote staff, the company has created a phenomenally interesting learning experience; I always look forward to one of these adventures. The “eco” boat looks like something out of The African Queen — an open-air, very simply made but sturdy and user-friendly vessel that probably seats 25 to 30 people. In the middle of the boat is a huge tank, or aquarium, that will be filled with the “goodies” discovered during the journey. Our guide is always an exceptionally knowledgeable student of marine biology who narrates the trip and offers details about almost every kind of wildlife we encounter. During my most recent trip, we saw many dolphins and birds, including white pelicans. And the boat always makes a stop at a small man-made island, where the guide describes how the land came to be and how it its management fits into the study and protection of the environment. But the Mote eco tour always saves the best for last — and it is the part during which youngsters on board are allowed to participate. The boat stops somewhere in Sarasota Bay, the huge net is lowered and a few minutes later, the net is lifted back onto the boat, brimming with the aforementioned “goodies.” Each fish or coral or rock is explained. Then, after it has been passed around to all the passengers, it is inserted gently into the aquarium. I may lack a companion on these Mote outings, but I am in the midst of a crowd of friendly, happy people relishing an educational experience. That makes the trip worthwhile for me. Once again, I am back in my comfort zone.